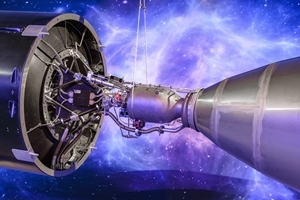 UK-based Orbex has unveiled a new rocket featuring the world's largest 3D printed rocket engine. It also unveiled new customers in the shape of smallsat manufacturer SSTL and Astrocast, which is building a global satellite Internet of Things (IoT) network. At a major launch event today in Scotland, where Orbex is building its proposed Scottish spaceport, Orbex announced that Swiss-based Astrocast has selected the company to launch as up to 10 nanosatellites by 2023 in support of its IoT network. The first satellites are planned for launch in 2021 from the proposed Sutherland spaceport in Scotland, onboard Orbex’s orbital launch vehicle, called Prime. Orbex said it is partnering with UK-based Surrey Satellite Technology (SSTL) to carry an experimental payload on its maiden flight from Scotland in 2021. The first launch of the Orbex Prime rocket will represent a first for the UK space industry, showcasing the UK’s end to end satellite launch capability, combining a UK rocket, a UK satellite and a UK launch site. As such it has the backing and support of the UK government and the UK Space Agency (UKSA). “The space sector is a great British success story and we are working closely with industry to ensure we thrive in the commercial space age,” said UK business secretary Greg Clark. New customer Astrocast is building a 64 CubeSat IoT network to deliver affordable data communication services to the world’s most remote areas. Designed specifically for IoT, Astrocast’s two-way system allows companies to monitor and control their remote assets, including over-the-air upgrades at lower latency and cost than existing satellite communications networks. Like other satellite IoT networks, this capability has applications across many industry sectors including environmental monitoring, security, maritime, mining, oil and gas and back-up. Astrocast’s system employs multilevel AES 256 encryption for more secure IoT communications. Orbex said that the partnership underscores that attractiveness of the UK’s satellite launch capability. Coinciding with the partnership announcement, Orbex publicly unveiled its Prime rocket for the first time at the opening of its new headquarters and rocket design facility in Forres in the Scottish Highlands. Designed to deliver small satellites into Earth’s orbit, the rocket was unveiled at an opening ceremony attended by VIPs from the UK and European space community as well as local community stakeholders. The completed engineering prototype of the Stage 2 rocket - the stage that will transit into orbital flight after launch - is made from a specially-formulated lightweight carbon fibre and aluminium composite and includes the world’s largest 3-D printed rocket engine. According to the company, Prime launchers are up to 30 per cent lighter and 20 per cent more efficient than any other vehicle in the small launcher category, packing more power per cubic litre than many heavy launchers. Seen for the first time, the 3-D printed rocket engine was uniquely manufactured in a single piece without joins in partnership with additive manufacturer SLM Solutions. Orbex also has backing from the European Space Agency (ESA) and the European Commission Horizon 2020 project.